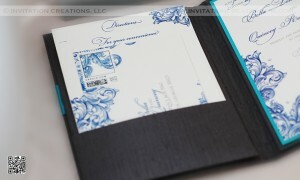 I am so grateful to have wonderful clients who really trust me and want a great keepsake for their guests. Bella wanted some silk invitation folios for some of her special guests. We included all the details like accommodations, response card and directions. 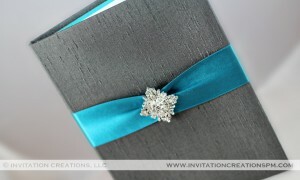 We also added 4 crystals to the invitation for some bling. Not to leave anything out, we also created custom stamps for the response cards. 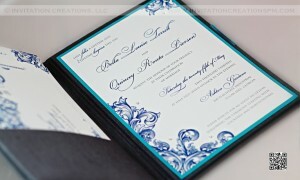 These invitations truly reflect on the bride’s desire to have a big impact on her guests. These no doubt did that. I truly wish Bella and Quincey the best marriage has to offer!